Pass a Balanced Budget Amendment to the Constitution. Such an amendment would likely create the discipline needed for Congress to be able to set priorities and decide what is more or less important with regard to the overall economy. Spending programs, tax revenue, and the effects of regulation would all have to be considered together to maximize economic efficiency. Lobbyists would have far less power to push one particular program independently of how it relates to everything else. Term Limits for national office. Knowing that one’s time in office is limited would help provide the strength to make the difficult tradeoffs necessary for good legislation and make officeholders more immune to special interest influence. Conclusion: Rather than making a likely futile attempt to reduce the amount of money in the political process, change the process sufficiently so that money doesn’t have as much influence! 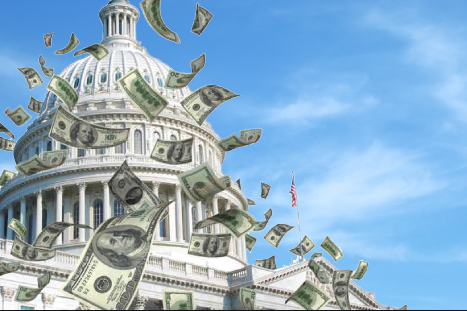 This entry was posted in balanced budget amendment, economic growth, economic mobility, Jack Heidel, James Bessen, lobbyists, technology, trem limits and tagged balanced budget amendment, economic growth, jack heidel, technology, term limits by jackheidel. Bookmark the permalink.